My list of top five lodges focuses on lodges which are either owner managed or managed by people who are not only keen wildlifers but also serious conservationists, follow eco tourism practices and have a passion for preserving India’s wildlife. They also, not coincidentally happen to be in my favourite parks. 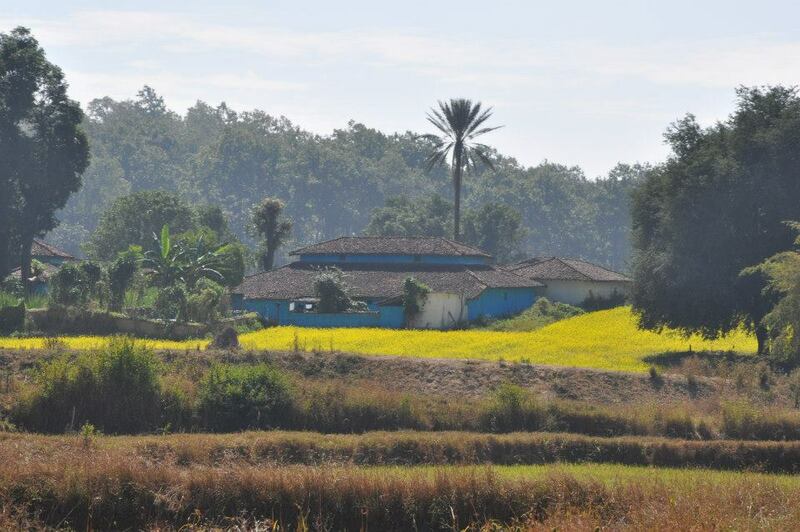 Satpura is one of the least discovered parks in Madhya Pradesh and I am almost loathe to promote it as I want it to stay that way. There are just three main lodges but my favourite in terms of quality of accommodation, experiences offered and the standard of the food is Reni Pani Jungle Lodge. Owned and managed by Faiz and Aly Rashid, from the royal family of Bhopal, and despite their deceptively laid back appearance, the place runs like clockwork and no comment, no matter how minor, goes without being anctioned. There are twelve, spacious, stylish yet eco friendly rooms, scattered around the property, a main lodge building where meals are taken and drinks consumed (!). Safaris take place every morning and evening but, and this is what is special about Satpura, they are not only jeep safaris. The park is surrounded on three sides by water and so canoeing and boating safaris are also possible, as are elephant safaris (subject to availability) as well as walking safaris through the core area of the park (I came across sloth bear on foot, leopard by elephant and wild dog by jeep). In addition, night drives to see the nocturnal shenanigans of the animals are possible in the buffer zone, as are 2 or 3 night camping treks to the old British Hill Station of Pachmarhi. This is a must on any serious wildlife itinerary. The home of Katie and Jehan Bhujwala and their two children Kai and Ella, who have to be India’s leading child naturalists and conservationists. This lodge, at the Mukki side of Kanha, has a special place in my heart as I managed it for six months back in 2006 and there is a part of me that wishes I could have just stayed, indefinitely. There are just six comfortable tents, scattered around the land which has been left as natural as possible and a main lodge building where meals are taken together, the fire is sat around and drinks and chats about the day’s sightings take place. The staff are all local tribals apart from Raj, one of the best naturalists in the area who comes from Nepal every year for the season. Food is home-cooked and delicious, the atmosphere is laid back, safaris operate every morning and evening and are always accompanied by their own naturalist, Raj or Jehan himself. Lunches are taken outside (season depending) over looking the dam, where birds daily come to drink and bathe, camp fires are lit in the evenings, and dinners are taken either in the lodge or at a location around the grounds (again, season depending). In addition to the safari’s, the ethos is that of taking the focus off the tiger and appreciating the other wildlife and people of the area, walks along the Banjar River are arranged, visits to tribal markets and for the more adventurous overnight cycling trips to stay in tribal villages, a unique experience! 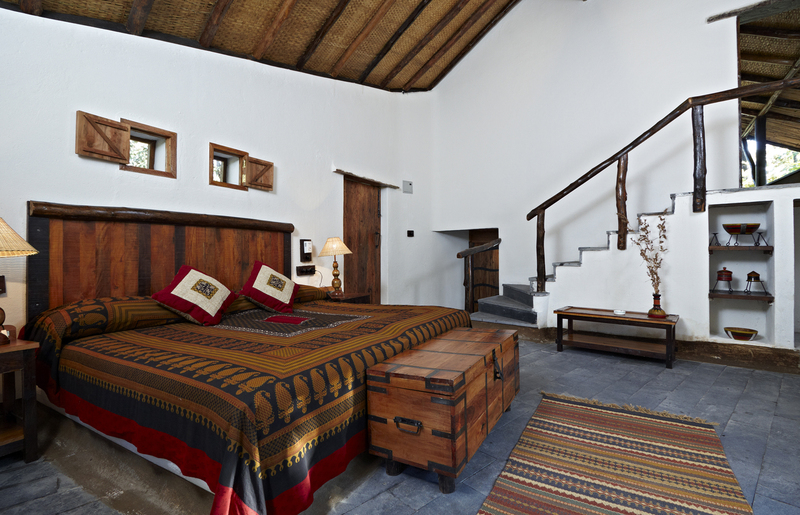 Bagh Tola is another lodge at the Mukki side of Kanha National Park. 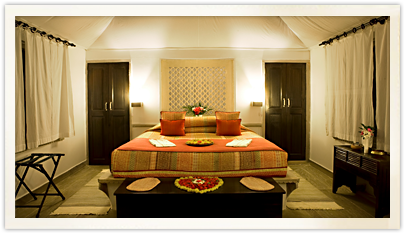 The lodge is designed to replicate the secure residences of the British Raj, as they forayed into the ‘inhospitable’ wilderness. There is a boundary wall, around 4 feet high, encased in brilliantly-coloured bougainvillea, which provides ‘safety’ (not that that is a concern these days) whilst also allowing beautiful views out over the countryside. There are just eight, large and comfortable rooms are situated in two courtyards, each courtyard having its own fire pit to enjoy post safari cocktails around as well as tales of the day’s sightings. The food, overseen by Joylet (surely one of the best names ever!) is delicious and home-cooked and takes into account the seasonal offerings from the local tribal markets. The dining room is light and airy and the library is well stocked with wildlife books, what else? But what makes this place is the manager/chief naturalist, Eric D’Cunha who has lived in Kanha for the last 30 or so years and not only knows it inside out and back to front, but knows all its inhabitants too. You can be in no better hands than on a safari with him. The other bonus, he is cat friendly and usually has one or two hanging around. Milly had just had kittens the last time I was there, it was almost too tempting to stay and play with them rather than venture out into the jungles in search of her bigger, more powerful and majestic cousins. 4. Khemvilas, Ranthambhore National Park. Take an overgrazed, decimated and barren plot of land, nurture it, plant trees, make a few water bodies and all of a sudden (in geological terms at least) you have created an oasis and brought nature back to life. Add one of India’s most prolific wildlife experts and conservationists and his wife who oversee’s the entire project, Goverdhan and Usha Rathore and you have quite simply, a fabulous place to stay in Ranthambhore National Park. Goverdhan was brought up in Ranthambhore by his equally famous conservationist father, Fateh Singh Rathore and Usha has run lodges here for years before setting up Khemvilas, she is a natural hostess with a keen eye for detail and bags of style. Accommodation is provided in elegantly-designed rooms (the best for families), tents or cottages (my personal favourites), the delicious vegetarian meals are served in the dining room (no prizes for guessing that), a small swimming pool provides a refreshing place to hang out between safaris but brave the waters at your peril from Dec – Feb. The water bodies provide a constant flow of life in terms jackals, jungle cats, hyenas, desert fox, and crocodiles, it is also a bird watcher’s paradise. Located as it is in the heart of the Golden Triangle, it gets pretty booked up, so plan early to avoid disappointment. 5. Jim’s Jungle Retreat, Corbett National Park. I refused to go to Corbett for years. Nightmarish stories of purpose built brick and concrete block hotels, no thoughts given to eco systems or conservation with, horror of horrors anywhere not just in a national park, night clubs and karaoke and you have a place that I have no desire to visit. Fortunately I then met Daleep Akoi who persuaded me up to Jim’s Jungle Retreat and I was so wonderfully, delightfully and pleasantly proved so so wrong that there wasn’t any place in Corbett that I would ever want to stay. Located in the quieter side of the park near the Jhirna gate (which also incidentally usually stays open all year round) Jims Jungle Retreat has just 18 accommodation types, a great restaurant, pool, enthusiastic naturalists and a host of alternative activities to enhance the jeep safari experience. The Jungle Lodge rooms, set apart from the rest of the establishment are at an elevation of 15ft with a wrap around balcony, give nice views over the surrounding buffer forest. The Jungle Cottages have a double bedroom and a twin room with shared bath, making it great for families, and there is also a family cottage. The menus are inspired from the local community which is where most of the staff come from and the food is delicious. 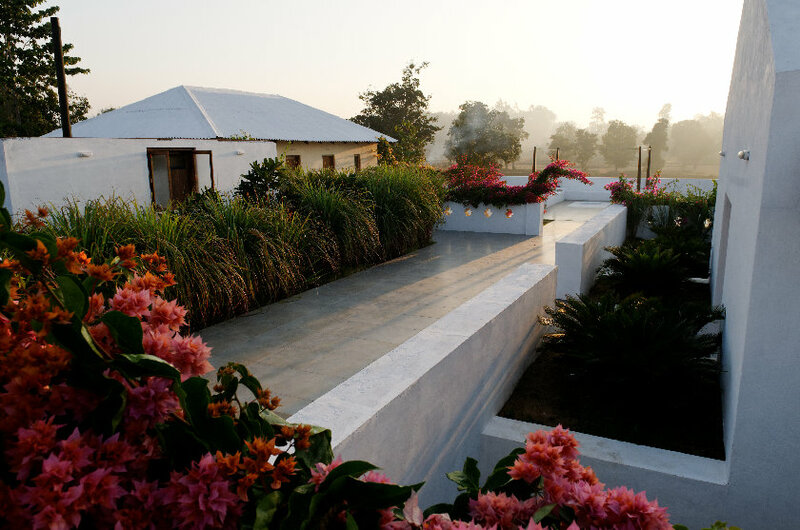 Leave early enough and you can reach in a five hour drive from Delhi, or take the train and benefit from a discount for taking a more eco friendly option! I also love their tag line, ‘Seek the tiger, find the jungle,’ as it requires patience to find a tiger and how better to utilise that time than to discover what else the jungles of Uttarakhand have to offer, beyond its wild elephants, which after all, you don’t the the help of an informed naturalist to spot! Of course, this list is not definitive and there are more wonderful lodges in the parks I have mentioned and also further afield, but if I mentioned those, then I wouldn’t be able to start my list of weekly ‘Top 5’s.’ Needless to say, there will be more to follow. For more information on any of the above click here. Click the follow this blog button to keep informed of new posts about life in India and more places to visit!